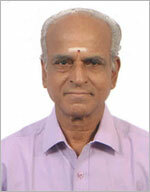 Mr. Gurumurthy has an overall experience of 42 years in the corporate and academics. He is a legend of knowledge and experience. Mr. Gurumurthy is enthusiastic and has the zeal to motivate the students. Mr Gurumurthy has done A.M.I.E. He has a P.G. Diploma in Business Management & P.G. Diploma in Materials Management. His experience includes working as Senior Manager at Bharat Heavy Plate & Vessels Ltd, Steel Authority of India SAIL, Telco & HMT ltd. As a senior manager he was responsible for Total Materials Management, Vendor Development and Inventory Control, Logistic Management. As a Visiting Faculty, with ICFAI, Asian School of Business Management, IIPM he taught Operations Management, Project Management, Quantitative Methods and BPR.